6 sets of variations. C.P.E. 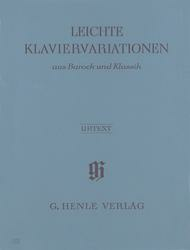 Bach: 6 Variations (First Edition) in C major Wq 118,5 • J.C. Bach: 4 Variations in G major, Op. 5, No. 3 • Beethoven: 9 Variations on “Quant' è più bello” from La Molinara by Paisiello WoO 69 • Händel: 5 Variations in B-flat major • Haydn: Variations in E flat, Hob. XVII:3 • Mozart: 7 Variations on “Willem van Nassau” in D major K. 25. With this selection of piano variations from the Baroque and Classical eras, we aim to facilitate the player's discovery of a vast staple of literature which represents, next to the sonata, the most important group within the classical piano repertoire. 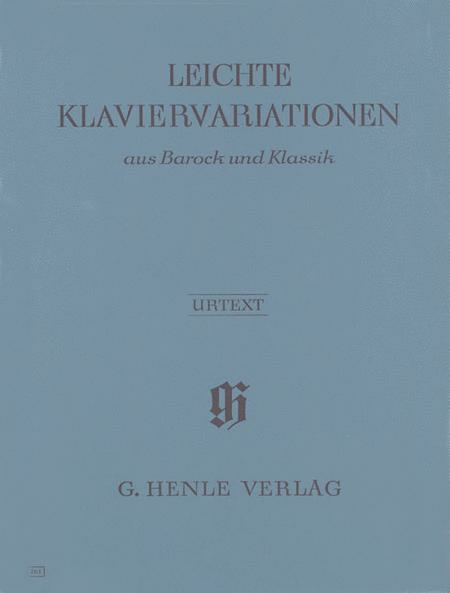 Variations by the two Bach sons Carl Philipp Emanuel and Johann Christian Bach as well as by Georg Friederic Handel neighbour on three cycles by the great Viennese classics Haydn, Mozart and Beethoven. Caution was taken so as not to surpass a medium level of difficulty (level 5).